True story: I grew up next door to Jim Henson. One day, after I was scared by his family’s cat (no kidding), a teenage Brian Henson “rescued me,” and decided to cheer me up by bringing me next door to see some of his father’s things. I don’t remember everything I saw, but I do remember a giant Ernie in the living room. To a child as small as I was, Ernie was literally larger than life, and I was so excited. The experience made this Muppet fan an even greater one. But you didn’t have to have an experience like I did to grow up a fan of the Muppets. You just had to be a kid once (though it would help if it was in the 1970s and 80s when Jim Henson was around, when The Muppet Show was a TV staple and The Muppet Movie was brand new). And that’s why so many of us (and the Walt Disney Company, too) are excited about Kermit, Gonzo, and the rest of the gang’s return to the big screen in The Muppets. Alas, I hate to break it to you, but the movie is ultimately a disappointment. 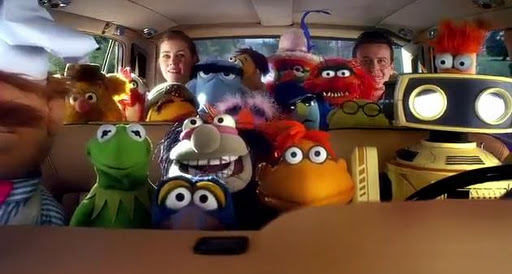 In the film, which stars and was co-written by How I Met Your Mother‘s Jason Segel, the Muppets have all gone their separate ways. 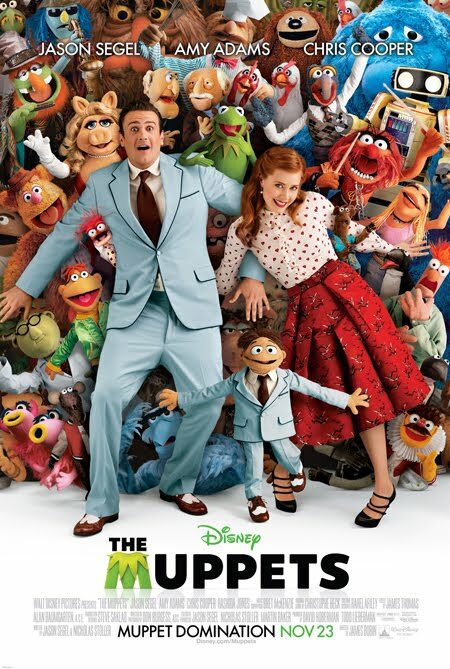 On a trip to Los Angeles, Gary (Segel), his girlfriend Mary (Amy Adams), and his brother Walter, a Muppet, discover that Tex Richman (Chris Cooper), a businessman, plans to demolish the Muppet Theater to drill for oil. (Mischievous laugh.) So Gary, Mary, and Walter reunite the gang so they can put on a show and raise the $10 million that will save the Theater. Insert songs (many of which were written by Flight of the Conchords‘ Bret McKenzie), and lots of jokes, and you’ve got the gist. For the first 10 minutes of The Muppets, the film is everything you could possibly want: It’s nostalgic and sickeningly sweet. The opening number, “Life’s a Happy Song,” is a catchy, fun, head bopper that’ll be stuck in your head for days. But then reality swoops in, and no amount of wisecracks from Statler and Waldorf can right the ship. Tonally, this movie is just off. In short: It’s a bummer. For example, Kermit lives alone in a big, gated house and he’s lost his zip. When we meet him, he sings a lament about how he misses the old gang. 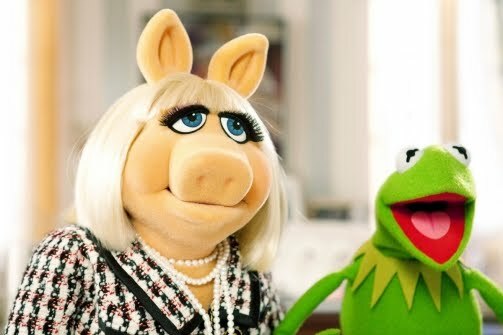 The guy’s got regrets … about Miss Piggy, about how he’s let his friends down, about how they’ve all lost touch. Even after he reunites with Fozzie, Scooter, Gonzo, and the others (finally, about a half hour into the movie), there’s still something off about Kermit. This is not the same dreamer who is the emotional center and can-do leader of his troupe. Today, he’s a bit of a loser as he keeps giving up at the drop of a hat whenever the times get tough. Kermit (and the movie itself) get little help from the story and even less from McKenzie’s songs. Other than that first one, McKenzie has written some real stinkers, most of which are downers or forgettable ballads. The whole film just smacks of a desperate reunion tour you’d see your favorite band put together. They can still sing the same songs (case in point here, “Rainbow Connection”) but they look older, they don’t sound the same, they try a little too hard, and the spark just isn’t there. No wonder Modern Family‘s Rico Rodriguez mistakes Kermit for a Teenage Mutant Ninja Turtle. 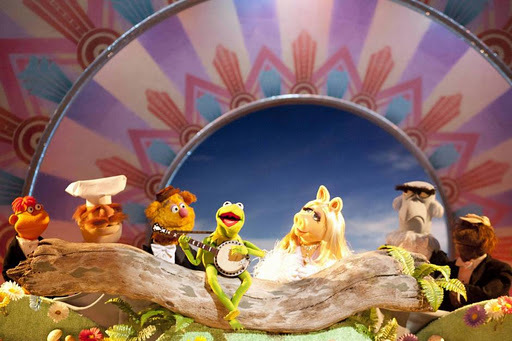 The Muppets doesn’t fill you with hope or make you feel like a kid again. It’s less a celebration of what we all love about the Muppets than it is a ploy to sell merchandise and theme park tickets. If only the movie could be a compilation of the great marketing efforts that have led up to the film’s release. Those fake trailers and song covers and YouTube videos were the Muppets we know and love. The movie itself is not. 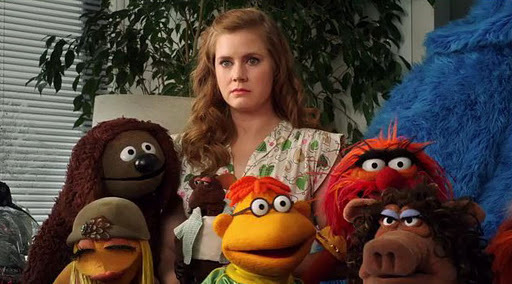 The Muppets is not completely awful (I did laugh a lot, particularly in the first half), but it’s just not the inspirational, celebrational or — most important — Muppetational film I was hoping for. Last year, when Woody, Buzz, and the gang returned in Toy Story 3 after an 11-year absence, Pixar did it right. Kermit and the gang, and we fans, deserved something better … something more like Toy Story 3. So I’m giving The Muppets a B–.